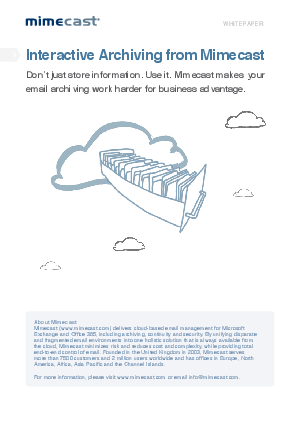 This Whitepaper puts forth the idea that the old on-premise archives are being eclipsed by the capabilities of a new type of Cloud-based email archive, an Interactive Archive. The Interactive Archive is a more useful, valuable and interactive archiving platform for business users. The Interactive Archive allows users to leverage the archive and data therein for business intelligence, as well as end user productivity, ubiquitous access, and the corporate governance and compliance requirements that underpin the archive itself.